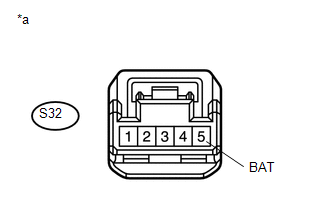 The skid control ECU (brake actuator assembly) outputs this DTC when it receives a sensor power source malfunction signal from the steering angle sensor. 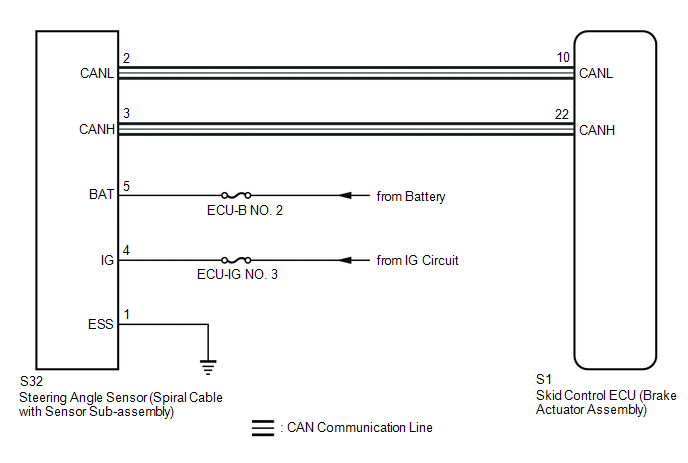 Steering angle sensor power supply malfunction signal is received from steering angle sensor. Do not remove the steering angle sensor from the spiral cable with sensor sub-assembly. When replacing the steering angle sensor (spiral cable with sensor sub-assembly), confirm that the replacement part is of the correct specification. When U0073, U0124 and/or U0126 is output together with C1432, inspect and repair the trouble areas indicated by U0073, U0124 and/or U0126 first (See page ). 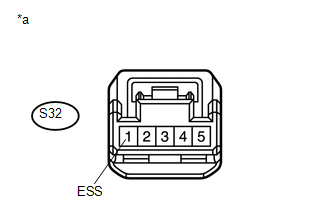 When the speed sensor or the yaw rate sensor (airbag sensor assembly) has trouble, DTCs for the steering angle sensor (spiral cable with sensor sub-assembly) may be output even when the steering angle sensor is normal. When DTCs for the speed sensor or yaw rate sensor (airbag sensor assembly) are output together with DTCs for the steering angle sensor (spiral cable with sensor sub-assembly), inspect and repair the speed sensor and yaw rate sensor (airbag sensor assembly) first, and then inspect and repair the steering angle sensor (spiral cable with sensor sub-assembly). (b) Remove the steering wheel and the column cover lower (See page ). (c) Make sure that there is no looseness at the locking part and the connecting part of the connectors. (d) Disconnect the S32 steering angle sensor (spiral cable with sensor sub-assembly) connector.